Congratulations to Shannen on passing her driving test First Time today at Heysham, only two little driving faults. A great result, I am delighted for you. Keep on driving safely and remember to watch that speedo! Congratulations to Ethan on passing his driving test on this on this cold February morning. A safe and thoughtful driver. It was a pleasure to help you to achieve your success. Best Wishes in your future career. Well done Ethan. 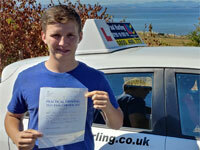 Ethan Says: Thanks Paul for taking me and assisting me in passing my driving test. Thanks for having confidence in me. You are a fantastic instructor so keep up the good work! 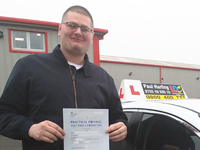 A fantastic well done to Lee today for passing his driving test. It was a real pleasure to share your journey. Enjoy your driving. Best Wishes and Stay Safe. I am very pleased to announce that Bethany passed her driving test at Heysham. A delightful learner. Thought you were going to explode when the examiner said you had passed. Stay Safe ... and keep up with the mirror use and the observations. Bethany said: Thank you so much for teaching me!! 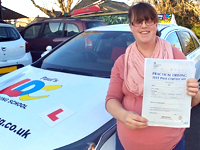 A big Well Done to Sammy Knowles for passing her Driving Test at Heysham. It has been a pleasure to watch your journey. An excellent learner... and now an excellent driver. Best Wishes Sammy. Drive Safely. 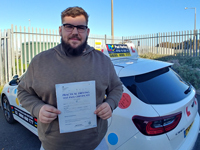 Sammy said: I started my lessons with Paul on my birthday back in July in which I was extremely nervous to start driving. Despite this, Paul made me feel comfortable enough to ask questions and gave me the confidence to push forward through the stages of driving. Even with my clumsy mistakes due to my clumsy personality, Paul was quick to react and with his teaching background in schools helped me overcome and improve on what caused the mistake. 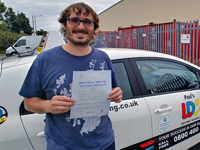 Paul will definitely go out of his way to help you pass your driving test and with his sense of humour and humorous stories he will make you feel calm before the test, whereas many other driving instructors do not carry this personal quality and can even make you feel worse. Raechel says: Thank you Paul. Great instructor. Happy driving to me. Congratulations to Jordan Paton for passing his driving test on his first attempt, today at Heysham. It was an excellent drive from Jordan ... as always. Well done and Best Wishes for the future. 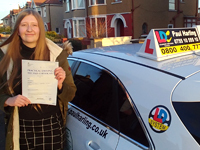 Congratulations to Georgia Wilkinson who passed her driving test today. Took us a little while to get there but am so happy that we did. See you on the road soon. Drive Safely and Best Wishes for the future. Georgia Says: "Thank You for all your help". I signed up for an intensive course with Paul Harling of LDC. 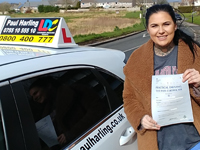 Prior to this, a few years ago, I was put off and became very anxious after driving with an independent instructor who was meant to be "specialised" in instructing nervous drivers. So, when I finally decided to resume lessons again, I found LDC on a Google search and was assigned Paul as my new instructor. I quickly grew in confidence, right from the get go, due to his support, clear explanations and humorous character! 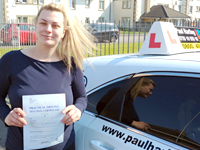 I found Paul to be a methodical driving instructor who was thorough, attentive and adapted lessons well to suit me as the learner. He went above and beyond to ensure that I passed and that I would be fully prepared for any circumstances that I might face in the future when driving. As a word about LDC, I have found the whole process of learning to drive surprisingly swift and have felt supported and safe throughout. Your book was also really key in clearly outlining all aspects of driving and providing different ways to explain things (e.g. lists, descriptions, diagrams, tests). Even before I had entered the car for my first lesson, I felt prepared after having read the first few chapters. 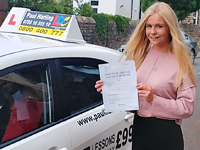 Massive congratulations to Lucy Oliver for passing her driving test at Kendal this afternoon. Only 3 little driving faults. It took us a while to get there but it was so worth it in the end. I am so so happy for you. Best Wishes and Stay Safe. Lucy Says: "Thank You so much. 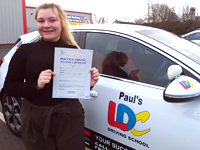 I couldn't have passed without you, you have helped me so much :-) I cannot thank you enough for everything :-) "
Paul has been an excellent instructor. He is always very clear in his instructions, always remains calm and he has a good sense of humour. Paul works with you to ensure that you concentrate on elements of your driving you feel you need to improve, but he also has the experience to find and focus on your areas of weakness. Thanks a lot Paul, you have been brilliant! Paul thank you for your help over the last few months and helping me pass my test. Would recommend you to my friends and family. Thank you for the LDC workbook that helped me keep track of my lessons and the things I needed to do as well. Well Done to Luke Robinson. Passed his test today ... first time. Only two minor faults. Best wishes to Luke. Safe driving. Luke says Thank You so much. A big thank you to Paul, my son passed his driving test today. 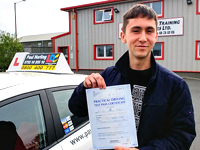 Paul’s effective communication style and constructive feedback have enabled him to not only pass his test but to enjoy the whole learner driver experience. 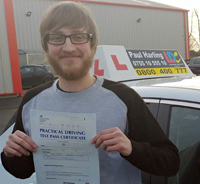 Paul isn’t just a driving instructor he is a natural teacher/mentor and we consider ourselves lucky to have found him. Thanks again Paul.